Gifts from Wicked Wicker, LLC: Don't Forget to Gift the Hostess this Holiday Season! Don't Forget to Gift the Hostess this Holiday Season! The Holiday Season is full of parties and get-togethers. It's a time of food and fun, so naturally when you go to one of these parties, all the hard work that the hostess put into the preparations isn't going to be the first thing on your mind. You just want to have a good time with everyone. In the end, being a hostess is hard work, and not only does it deserve a little thanks, but it will keep your hostess from being discouraged. Please don't overlook the hostess this year. 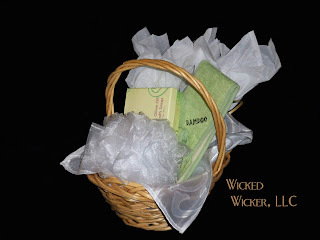 Instead, why not give her a basket from Wicked Wicker to show your thanks? After throwing a Holiday Party, she could use it!